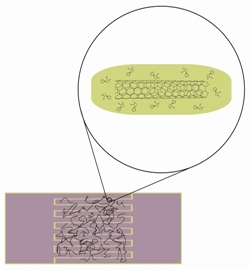 We have developed a conductive sensor incorporating single-walled carbon nanotubes coated with molecularly imprinted poly(vinylpyrrolidone) films and report on its characteristics for cotinine detection via changes in resistance. We find significant increases in the resistance of these imprinted films in comparison to control films involving coating with unimprinted polymer. The resistance of the imprinted sensors reverts to the unimprinted value upon removal of the cotinine from the imprinted films and the cotinine-present value is recovered when the sensor is placed in a solution containing cotinine. Molecularly imprinted polymer (MIP)-coated carbon nanotubes offer the possibility of a simple, general technique for the creation of molecule-specific sensing elements.